Leilehua High School student Tabitha Taraya has been taking art classes since she was 6. 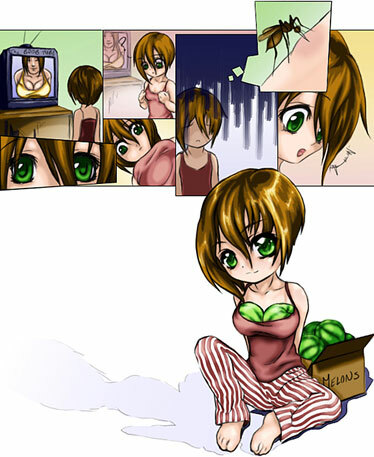 Above is "Melons (2008)," computer art. It won an honorable mention in the Manga Bento Art Contest. "Art students do not usually get attention," art instructor Lawrence Taguba wrote, "but Tabitha is exceptional." The proud Leilehua High School teacher was seeking to direct some limelight on the achievements of his star student, Tabitha Taraya. 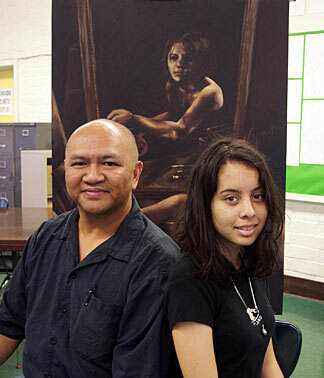 Taraya and her high school art teacher Lawrence Taguba, in front of Taraya's painting that won the Tadashi Sato award. Taraya later gave the painting to Tagulba. Taguba was justified in doing so. In her high school career, Taraya racked up 13 regional and five national Scholastic Art awards, given to the top public and private middle and high school artists across the country. "To put her accomplishments in perspective, every year more than 100,000 student works are judged in regional competitions across the country," Taguba wrote. "Only 10,000 are forwarded to the national judging ... (and) approximately 1,000 students win awards on the national level." Among Taraya's honors is the American Visions Award, the creme de la creme of the Scholastic awards - which she won twice, the first Hawaii student to accomplish the feat. This year, she also won Hawaii's inaugural Tadashi Sato Living Art Scholarship Award for Artistic Excellence, named after the iconic local painter. She was selected by a jury at the Hawaii State Art Museum for creating a work that conveyed an "emotional and spiritual essence that transforms art into a living work." Taraya's talent revealed itself early; she was just 6 when she took a class at the Academy Art Center and so impressed instructors that she was invited back to study for free. "Art has been a part of my life since I can remember," she said. Last month, the recent Leilehua graduate embarked on a new adventure: An education at the prestigious California College of the Arts, where she was granted a generous scholarship. FOR ALL the achievements Taguba lists, he is sharing only half of his student's story of success. The other part began with a stroke of luck that originally appeared to the Taraya family to be misfortune. In preparation for high school, the family sought what they thought were greener pastures, applying for a geographic exception to Moanalua High. All was on track, "until Moanalua lost her paperwork," recalled Taraya's mom, Susan. "On her first day at Leilehua, we were both crying." A few months later, as the family worked on getting Tabitha into a private school, Leilehua held its first parent-teacher conference of the year. "When we first met Mr. Taguba, he showed us her work and he was so proud," Susan Taraya remembers. "Then he became indignant when he found out what we were planning. He told us, 'Your daughter's got incredible talent. No one will take care of her like I will.' "
The family decided to give him a chance. At Leilehua, art students are required to enter competitions after their first year. Taguba took one look at Taraya's freshman drawings and paintings and knew she was something special. "In 30 years of teaching, I haven't had a more talented student," Taguba said. "Most students start out showing signs of potential, but they need to be taught basics. Tabitha knew all that already. She was very serious about her craft - and she immediately began winning awards." All of Taguba's enthusiasm is returned to him in equal measure by the family. "I can't say enough about Mr. Taguba. He's done a great job of helping Tabitha succeed. Now she's got great life experience, and she's far more focused than I ever was at her age," said Susan Taraya. "I couldn't have paid anyone to care for her better." "Mr. Taguba's really great," said Tabitha Taraya. "He goes out of his way to help his students. He's passionate about our work - our success does mean a lot to him."